Soquel Creek Water District consolidates data for better groundwater management as California monitors basins, seawater seeps into aquifers, and population growth. Situated on the north shore of Monterey Bay, Soquel Creek Water District customers rely on groundwater for 100 percent of their drinking water supply. Major underground aquifers like the Santa Cruz Mid-County Groundwater Basin are being drawn down faster than rainfall (or recycled water) can replenish them. Despite extensive water conservation efforts by customers, the basin remains in a state of overdraft. As the largest pumper in its groundwater basin, Soquel Creek Water District assumes monitoring responsibilities. As it collaborates with water leaders across water boundaries to find solutions, the amount of data collected continues to grow. To get ahead of data overload, district staff consolidated its data silos. A new centralized system overcame differences in file formats from historical and current sensors and loggers. Water Information System by KISTERS (WISKI) offers secure storage and backup as well as options for a contracted hydrogeologist consultant to access data as needed. Most importantly, personnel are empowered to more easily evaluate the state of the groundwater basin as the Sustainable Groundwater Management Act (SGMA) was signed into law in 2014. Proactive collaboration among local water agencies before SGMA became law gave the Mid-County Groundwater Agency (MGA) a leg up. By 2015, development and calibration of an integrated surface and groundwater model had begun while other groundwater sustainability agencies (GSA) were still forming. The incredibly complex model requires lots of input and assumptions. Soquel Creek Water District staff leverage WISKI to enhance data validation processes. For example, they ensure manual water level measurements and automated logger data values fall within an acceptable range of error. Personnel also use advanced data visualization tools to compare water level data across multiple wells. An estimated one million data points are now plotted in seconds and explored with more tools. Previously, staff received an annual report with static plots for review. KISTERS' water data platform integrates data streams from pumping SCADA systems, weather station, in-situ creek sensors, and groundwater well data loggers. 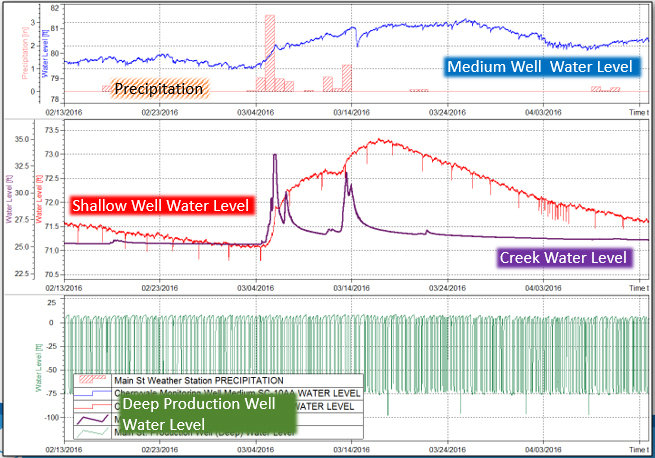 Stacked hydrographs confirm pumping the deep production well (shown as a green line) doesn’t impact more shallow monitoring wells located nearby (shown as blue and red lines). 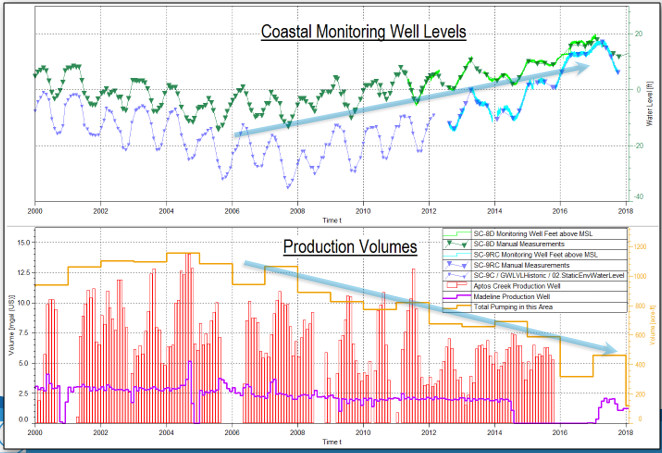 On the other hand, rainfall (see red bar graphs) increases water levels in both shallow and medium monitoring wells. While SGMA and coordination of the 11-member MGA will inevitably pose some challenges, the primary problem Soquel Creek Water District faces is seawater intrusion. Until the district can diversify its water supply, preventing saltwater contamination is the greatest priority. 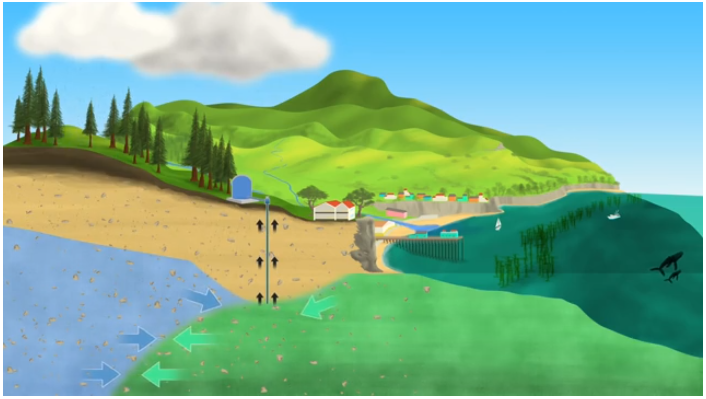 In an ideal coastal water cycle, groundwater levels are sufficiently high to actively keep out seawater. And rainfall replenishes the volume of water pumped out of the ground. However, multi-year drought conditions and aquifer overdraft have dropped groundwater levels too low to protect against seawater intrusion. Now present in Aptos, Seascape, and La Selva Beach, saline contamination threatens freshwater supplies. The irreversible condition often results in either abandoning wells and constructing pumps further inland, or requiring costly treatment to meet drinking water quality standards. Since the extent of seawater intrusion can vary among localities and hydrogeological settings, integrating GIS applications with WISKI helps Soquel Creek Water District and consultants quantify the extent and rate of seawater intrusion -- which is key to sustainable management and use of groundwater resources. Again with WISKI graphing tools, district staff quickly identify that decreased pumping from specific production wells allows water levels to recover in coastal monitoring wells. The decrease in the need for pumping is credited to customer water conservation efforts, which have reduced overall use by 25 percent. Concurrently, the district is making efforts to reduce its dependence on groundwater. Alternative water supply sources include a water recycling plant and agreements with a pending water desalination plant as well as the City of Santa Cruz for its river water. While the new state groundwater policy will present new challenges, it's anticipated to reveal more opportunities. Now that Soquel Creek Water District has streamlined its access to quality data and strengthened its analytical capacity, it's better positioned to cooperate with regional governments and utilities in order to lessen its vulnerable reliance on groundwater supplies, focus more on effectively remediation of saltwater intrusion, and handle even modest rates of population growth.